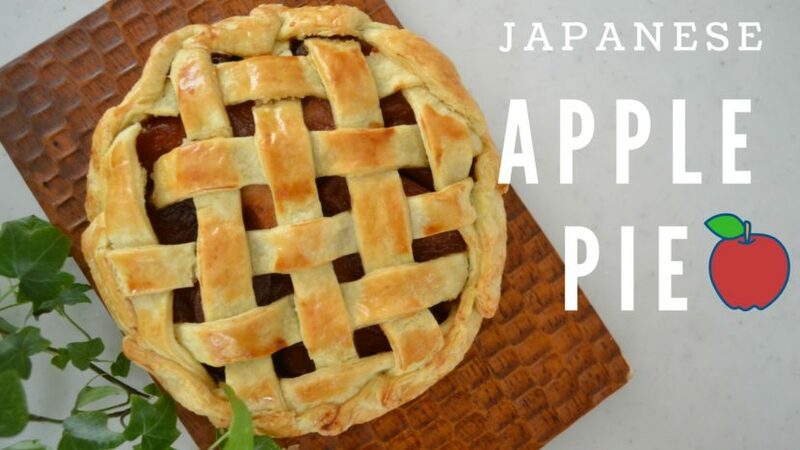 What makes an apple pie “Japanese” ? I would say beautiful lattice and the taste of apple. We have a very nice apple to make a pie. That is Kougyoku, which is tart and crisp and keep its shape well, similar to Grany Smith. We can find apples any time of the year, but the Kougyoku is in season very limited of time. I always use the apple in the highest season because it’s tasty and cheap. If you happen to be in Japan this time of year, give it a try. Find the tart and crisp apple like Grany Smith or Fuji for this recipe. The pie express is my favorite crust. It takes less time than the usual pie pastry, but the result is pretty good. The texture is flaky and light, goes well with apple filling. Moreover, easy to eat! ※Slice the butter into a quarter inch slices and chill until used. 2.Slice the butter in the tray, flour the each strip as you go. Then, rotate the tray and cut the butter into small dice. 3.Sprinkle with icy water and toss to distribute evenly. 5.Flour the working surface and start rolling. If it’s too hard, tap with a rolling pin. Roll out the crust 15cm(6 inches) by 40cm (16 inches), fold in 4. Back in a fridge for about 1 hour. 6.Roll out again and fold in 3, this time. Back in a fridge for 1 hour. You can definitely make ahead; the pie express crust will keep well in the freezer up to 3 months. ※the butter and the heavy cream should be at room temperature. 1.Cut the apple into 4, and core and peel. Cut into wedges. 2. Put 60g of sugar and a tablespoon of water into frying pan, turn on the heat to medium. Cook until the sugar melt. 3. When the sugar turns into caramel to your liking, add warm heavy cream and butter and boil until homogenized. The darker the caramel; the bitter the taste would be. 4. Add apples and cook until apples soft and almost all of the moisture evaporated. 5. Add 30g of sugar to just balance out the sweetness and bitterness. The reason why I add sugar later is, the sugar won’t be caramelized with apples. If I don’t add sugar, the filling would be too bitter and tart. 6. Sprinkle with some Calvados to make it even better. 7. Transfer to a bowl in the ice bath. For the egg wash, mix one egg yolk and one tablespoon milk. 1. Divide the crust into two. 2. Roll out the one dough into 4-5mm(1/6 to 1/5 inch) thick. It should be big enough to cut out 21cm(8.4 inches) diameter circle. 3. Roll out the other into 3mm (1/8 inch) thick, 20cm(8 inches) by 28 cm (11.2 inches) rectangle. Chill in the freezer to easy handling. Cut out 10 to 12 strips by using a pizza cutter. 4. Weave the crust strips like this. Cut out the center of the weave with 15cm(6 inches) circle. This part is going to be a lattice. Yes, we make it ahead. Don’t do it on the apple filling. The strips will soon be soft, and it’s going to make a big mess, and you will be stressed out. Chill in the freezer. 5. Put the bottom crust onto parchment paper and prick all over. Brush egg washes for the edges. 6. Sprinkle with some cake crumb or cookie crumb or even Panko breadcrumb will work. Pile up the good amount of apple filling, and lattice crust on top. Pull up the bottom crust and stick to the lattice with making pleats. 7. Put the apple pie into the circle mold, and brush the surface with egg wash.
8. Bake it off at 400℉（200℃）for 40 to minutes or until golden brown. I love the shape of this pie. Every time I make this pie, I fell like I am doing something great. Because it looks so different! Serve with slightly sweetened whipped cream or vanilla ice cream. The piecrust is flaky and light; the apple filling has so much flavor. The balance between sweetness and tartness is so perfect. So good! I hope you will give this recipe try soon!